Buckwheat is a pseudo-grain that can be hulled and cooked as a staple or eaten as sprouts. Annual with white flowers. Attracts ladybirds, hoverflies and caterpillar-parasitic tachinid flies. Can be used as a green manure. Rich in vitamins and minerals. 7-9 weeks to harvest. 300 un-hulled seeds per packet. Buckwheat is an ancient grain-like seed first cultivated around 8000 years ago and spread throughout most of Europe and Asia. The wild plant from which cultivated buckwheat was bred is native to Central Asia. This is an open-pollinated variety meaning that you can collect seeds from the plants that you grow and they'll be viable and grow true to type. 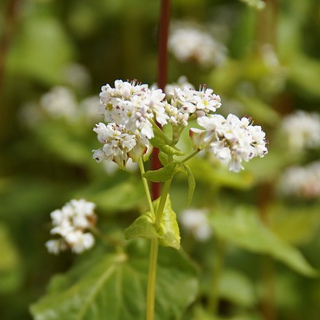 Buckwheat is grown for its seeds which are generally hulled and used to make a gluten-free flour alternative. Buckwheat seeds aren't a true cereal as they don't come from a grass but are used similarly and therefore known as a pseudo-grain. Finely ground buckwheat flour can be used for making noodles and savoury pancakes. Coarsely ground buckwheat groats can be roasted and cooked in liquid to make a porridge. Buckwheat seeds are rich in vitamins B2, B3 and B5 as well as the minerals manganese, magnesium, phosphorous and zinc. The seeds can also be eaten as sprouts. Buckwheat has a deep tap root which can retrieve nutrients from deep in the soil, helping to return them to the surface layers once the plants have finished producing and are composted. This characteristic along with the large amounts of seed they produce make them suitable for use as a green cover crop for planting in vegetable beds between crops or during non-cropping times. Buckwheat flowers provide a source of nectar for the adult stages of many beneficial insect predators. The threshed hulls from harvested buckwheat seeds can be used as an alternative to feathers and synthetic fills for stuffing pillows and other upholstery. Buckwheat can be planted in chicken runs as poultry forage. Buckwheat grown nearby can help to improve the growth of pumpkins and other squashes. For best results grow buckwheat in a location that receives full sun or light shade. Ensure your soil is free draining, to improve your soil structure dig lots of organic matter through your soil prior to planting buckwheat including well rotted animal manures, compost and worm castings. Buckwheat isn't a heavy feeder and will not crop better with additional fertiliser applications during the growing season so apply only if nutrient deficiencies are apparent in your plants. Buckwheat doesn't require much additional water once established, water every few days during hot, dry spells. Buckwheat grows well in soils with a wide pH range but does best on slightly acidic soils with a pH range between 6.0 and 6.5. Buckwheat is frost tender. In cold and mountainous regions of Australia sow buckwheat from September to November or from February to March. In temperate and subtropical regions of Australia sow buckwheat from August to October or from February to April. In tropical regions of Australia sow buckwheat during the dry season any time from April to July. Sow buckwheat seeds 15mm deep spacing plants about 15cm apart. Alternatively if you are sowing buckwheat as a green cover crop scatter the seeds evenly over the soil surface and rake them in well. Most buckwheat seedlings will germinate 5 to 10 days after sowing the seeds. Buckwheat take between 7 and 9 weeks to set seed ready for harvest.